First I want to make a point. Valentina is an open source program with a limited and very busy staff. It works really well in many ways. There remain a few functions that need a bit of work, but I am writing this post to assist those who may not have time to do what I did, which is search the entire forum and the documented issues plus do some trial and error to figure it out. @dismine and @slpencer please feel free to correct me if I say something that is not accurate. On this thread, I will attempt to gather some of the posts that I and others have made to create the instructions for using the parts of Valentina that already work very well to print a usable pattern on letter or A4 paper. For the purpose of these instructions it does not matter which of these sizes you use, these instructions are for those users who do not have access to a large format printer or plotter to print the entire layout in one big page. I will not go into detail here on why it is important to do these 3 things before you attempt to print. There are instructions on the wiki including video of many of the steps being performed. I will just state the 4 steps here. 2) Select “Details” mode. 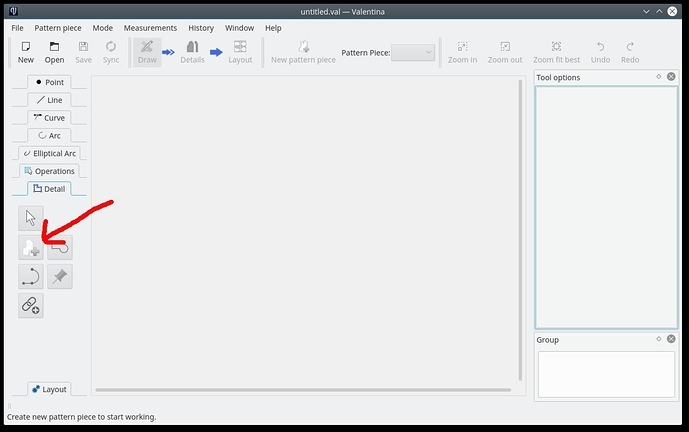 “right click” on the detail which represents the pattern piece you created. Enter any details that you intend to see on the printed pattern. Please be aware that what you will be printing is very much like a commercial printed pattern and will not contain all of the points you used in the draw mode. 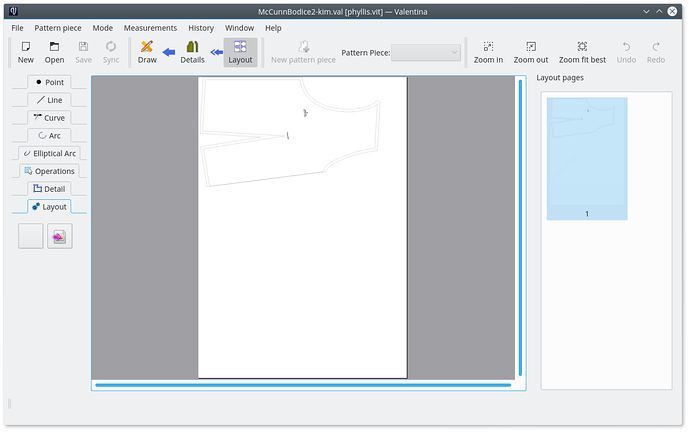 If you want to learn more about this, please read “New Feature: Just print the drawing” https://bitbucket.org/valentinateam/valentina/issues/554/new-feature-just-print-the-drawing. Click on “File” in the Valentina main menu along the top. Roll the cursor down to the selection “Layout” and roll the cursor right to click on and select “Preview tiled PDF” You will see a preview window and you may use the navigation icons at the top of that preview window to examine the images that will actually be printed on your printer. You may click on the printer icon at the far top right of the preview window to get a pop up window that lets you send those pages to your printer. You may click “Options>>” at the bottom left of the pop up window and use the options to select specific pages to be printed. This can be useful if your layout contains many blank pieces of paper which you do not need to print. Remember, if you have generated the layout correctly, the scaling will work and the measurements on the paper will match the measurements you used to create the pattern in draw mode. The pages will be clearly marked with dotted lines along the edges that need to be joined together. Where overlapping paper needs to be cut off, there will be a scissor icon to illustrate that this edge needs to be cut along the line. If you do not see those dotted lines and scissor icons, it is highly likely that the margins are set too small for the printer you are using. Personally, I have found that a glue stick is much faster and easier to use when joining the pages, but tape or staples will work. Not all of those options will work perfectly when printing individual pattern pieces on small (letter or A4) paper pages. If you discover specific and repeatable problems with any of these options, please discuss your findings on this forum in the category “issues” or go to https://bitbucket.org/valentinateam/valentina/issues and create an issue. The developer will be much less likely to “fix” an issue if the problem can’t be described clearly. Detailed instructions for “generate a layout” The remaining text in this long winded post is a really detailed discussion of the layout mode window, step 3 above. The window will pop up and will look something like this: Remember that these instructions are for printing a set of tiled pages on a printer that will not print large sizes. It is important to understand that “paper format” at the top left of this window is NOT the paper format in your printer, it is the format of the layout. I will not attempt to explain the difference right here, just please trust me and feel free to do some research of your own if you need an answer. (you may find this link helpful: Printing pattern on A4 paper) You must select a value in this window for “paper format” that is big enough to hold your layout. A0 is usually a safe bet. The bottom left corner of the layout window has a box labeled Printer: and you should be able to click inside that box and select from the printers available on YOUR machine, if more than one option exists. The “Fields” below the printer selection must be large enough for the detailed alignment grid and scissor icons to print. If you create the fields on the layout too small for this, the scaling will not work properly. If you check “Ignore fields”, the scaling will not work properly. The term Fields is synonymous with the more commonly used term “Margins” which describes the portion of a paper page that is not accessible to be printed upon. Many word processing and other programs allow the selection of margins. The printer driver installed determines a minimum size and if you attempt to print outside the printable area (into the margins) you will see an error in a pop up box “Fields go beyond printing. Apply settings anyway?” If you click yes, the layout may look good on the screen, but when you attempt to print it onto paper it will be distorted and the cutting and alignment guide lines may be partially missing. Please make sure that the fields/margins are set large enough that your printer is able to print the entire image sent to it by the Valentina program. The top right of the Layout window contains Layout options (gap width) and (shift/offset length) I do not know what these are but I do know that they are unimportant to printing a tiled layout onto letter size or A4 paper. Below that is a box to select “rotate workpiece”. If you have more than one pattern piece, it is important that you select that box. I believe that the options there are important if you are generating a layout for cutting pieces of fabric with a one way design, and may be important for other things. I believe that if you intend to print individual tiled pages and attach them to create individual pattern pieces it does not matter what the value is here. I use 90 degrees, and this may result in the grainline in the layout not being consistent among pattern pieces. If you intend to cut them out separately, this is not an issue. If you need the pieces to all be oriented in the same direction, use 180. If you need to know more about “rotate workpiece” please do some research. The remaining option seem not to be important for generating an layout for tiled printing onto small sheets of paper, so I will not discuss them here. @dismine and @slpencer please feel free to correct me if I say something that is not accurate. Your tutorial was great just to this part. This part is not correct. I already described correct description in the wiki, but looks like @slpencer did not used this page UserManual:Creating_Layouts. Current page about the Layout mode doesn’t cover all aspects.